BARCELONA — What Derrick, worry? Nah. “I think I played all right,” Rose was saying late Thursday night after the USA cruised into the FIBA Basketball World Cup final Sunday with a going away 96-68 victory over Lithuania. “Missed shots. “Missed almost all my shots,” Rose added with a laugh, sort of shaking his head at the curiosity of one of 18 three point shooting in the tournament. “But feeling good we got the win. So I’m not worried about that. It’s really no worry for the USA team likely to win the gold medal with co-favored Spain upset Wednesday night by France. The USA team leaves here for Madrid and now plays Friday’s France/Serbia winner. And other than the disappointment, for spectators, of perhaps the first serious challenge to the USA in this tournament, it looks like all clear for a second consecutive USA win in this tournament for the first time. And, really, no real concern about Rose any longer after playing aggressively through eight tournament games. Rose’s statistics haven’t been special as he comes off the bench, averaging about 17 minutes with 5.4 points and 2.8 assists and 27.3 percent overall shooting. Rose Thursday played just under 15 minutes with four points, shooting one of eight and sat out the fourth quarter after the USA went up by 27 after three. Although Rose’s numbers haven’t been substantial (James Harden leads the team in scoring at 13.1 per game, though he was scoreless the first half of the last two games), Rose has shown great quickness and explosion to the basket, tremendous activity on defense as he had another strip and several deflections Thursday and has passed the ball well. He had one highlight play late in the game, cupping the ball as he blew past the defense and finishing with a reverse layup. Most significantly, Rose has suffered no health ill effects. He’s moved sharply and confidently, especially after his little “green light” talk from coach Mike Krzyzewski before Tuesday’s win over Slovenia when Rose had a dozen points in 18 minutes. “That’s all I need, to see one go down and I’ll be all right,” Rose reiterated. “But I’m just happy we got to the championship game. We worked our butts off to get this far. That’s exactly what we wanted to do; that was the goal. We got a shoot around and then practice and then we‘ve got the game we’ve been waiting on every since we signed up for this team. So we’re very excited. And it will be time to go home. But Rose’s observation is also an admission that despite the one sided nature of the final scores, this isn’t as easy as it looks. This is a no-win situation for USA Basketball, in essence. You just can’t lose as NBA stars against what seems like makeshift groups of players. After all, if they were so good wouldn’t we have heard of them? We heard of the guys from Spain, and now they’re out. It’s single elimination, all seventh games, so there is no time for a bad game. And it’s not like the other guys are intimidated, like they were here against the 1992 Dream Team when opponents were asking for signed sneakers. This time the USA players were more likely to get a kick. Late in the first half, DeMarcus Cousins (who else?) faked throwing a punch at Toronto’s Jonas Valanciunas after a stray elbow that didn’t appear to be unintended. During the game amidst foul trouble for numerous USA players, coach Mike Krzyzewski was trying to calm his players on the bench and after the game was seen yelling at the Lithuanian players, who seemed ready to get into a scrum with the USA players as they were leaving the court, leading to a chorus of whistles from the crowd, which serves as booing here. Both Cousins and Anthony Davis fouled out, Davis on a foul and technical, the latter which counts as a personal foul in international rules. Stephen Curry played just 13 minutes with three early fouls as the USA went to major substituting early as Rose was in about three minutes into the game with the USA inching ahead 10-9. It would be a rocky start for Rose with a missed three and a three first quarter turnovers, though one was when he had to catch a Thompson pass going out of bounds. But Rose continued to, as he said, effect the game on the defensive end with a strip that led to a score and hustling back to stop a fast break and get in position for a charge. Rose also had a quick move and was fouled, making both, and a terrific no look drop off pass to Cousins for a score to end the first. But it was a halting start for the USA again, tied with three minutes left in the first and leading 21-16 after one. The USA couldn’t shake the physical Lithuanians and led 43-35 at halftime. The USA’s plan always remains to push the ball in transition to create breaks for dunks and layups. Every team fouls a USA player immediately if there is the hint of a break, and the USA players in their haste to run out left early several times. It led to Lithuania players recovering the ball and scoring. But the pattern of the tournament has been the USA’s superior depth and athletic ability with full court pressure wearing down opponents. That happened again Thursday in the semifinal game as the USA bolted out with an 18-2 run to open the second half, shooting 14-19 in the third quarter and forcing eight turnovers to effectively end the game. James Harden, who was scoreless in the first half, had 16 third quarter points. Kyrie Irving led the USA with 18 points and Thompson, continuing to be the most reliable shooter for the USA, also had 16 points. Rose finished with four points. “Somehow we just wake up (in the second half),” Rose noted. “First half we try to put them away; we tried a couple of games. It’s not like we’re not trying. It just seems that in the second half we always find that space and opportunity to get after them. Not so for the home folks as Spain suffered that shocking upset the night before and was out of the tournament. It came on the eve of a special day here, National Day, Sept. 11, when in 1714 the city was overrun by Spain and lost its effective independence, it’s language banned, cathedrals and schools closed. Thursday was the 300th anniversary and coincided with a trend sweeping Europe of successions for independence. There were marches and rallies throughout the city Thursday for independence for Catalonia, though the Spanish government is refusing a vote. Next week, Scotland is voting for independence from England, and it’s another Sept. 11 as it was Sept. 11, 1297 when William Wallace (who we know as a blue face Mel Gibson with a bad Scottish accent) led forces to defeat the English army and gain Scottish sovereignty. But there would be no celebration for Spanish basketball fans with its cherished team being beaten by, of all, the French, who also, by the way, helped Spain in that confrontation 300 years ago Thursday. 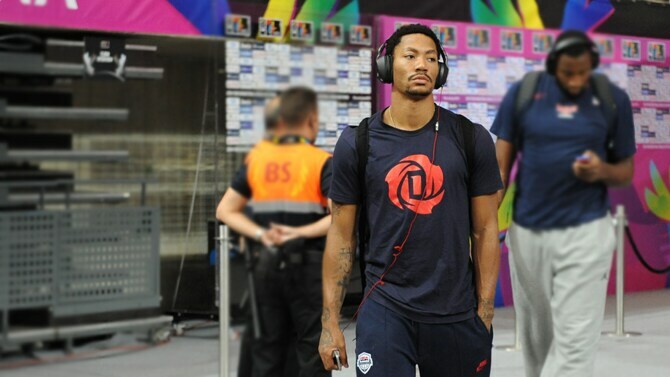 “I was very surprised, very surprised,” Rose said of the Spain loss. “I think everyone was, but with a team like that you can just learn from it. They didn’t come out prepared. And we just tried to make sure we came out prepared and make sure we talk to each other before the game to make sure everybody came out and wanted to play hard. Few among the USA players wanted to give France or Serbia any extra motivation, especially as France has NBA players in Nicolas Batum, Rudy Gobert and Boris Diaw. But Kenneth Faried, who led the USA in offensive rebounding as the USA had a 50-38 overall rebounding advantage, said he wasn’t surprised Spain lost. Some smack there. See, it’s not all friendly.